Yewfield Vegetarian Guest House Guest AccommodationA peaceful and quiet retreat in the heart of the English Lake District. Yewfield is ideally situated for walking and enjoying this exquisite region of rare natural beauty and inspiration of the Lakeland poets. Situated in 80 acres of land with walks straight from the grounds to Tarn Hows. This impressive Victorian gothic house is ideal for a quiet and peaceful retreat. Children welcome from age 9. Yewfield Vegetarian Guest House sometimes limits bookings to 2 or more days. An outside superior room next to the main house with its own private patio. This spacious room has an en suite walk in shower. 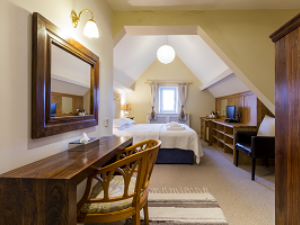 Available as a double or twin room, extra person in the room can be accommodated on a bed settee. Juniper sometimes limits bookings to 2 or more days. 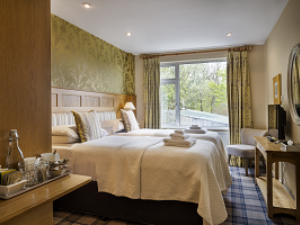 Standard room with a super king size bed that can be made up as a double or a twin, with nice views overlooking the vegetable garden towards the hills beyond. It has got a walk in shower. Room 10 sometimes limits bookings to 2 or more days. A superior room with a super king size bed that can be made as a double or twin. It is overlooking the tarn with views extending towards the mountains. En suite bath with a shower over it. Room 12 sometimes limits bookings to 2 or more days. Standard room with a super king size bed that can be made up as a double or twin. This room at the top of the house has a nice view over the Vale of Esthwaite from a small window. Bathroom has a bath and a shower over it. Room 17 sometimes limits bookings to 2 or more days. Yewfield is situated in 80 acres of private grounds at Hawkshead Hill 1.5 miles from Hawkshead. 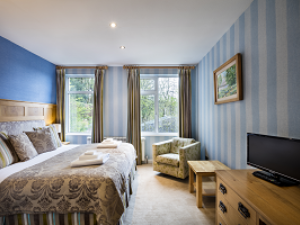 4.5 miles from Ambleside and 9 miles from Windermere train station. Take the Coniston Road A593 and at Clappersgate approx. 06 miles turn left on the B5286 road to Hawkshead after approx. 1.5 miles there is a turning to the right sign posted to Coniston, Tarn Hows and The Drunken Duck. Turn right here and keep going straight on past the Drunken Duck we are on this road approx 1.7 miles past the Drunken Duck you will see the road sign Hawkshead Hill go up the hill we are at top on the right. Directions From Hawkshead (please be aware that Yewfield is not on the Hawkshead Hill road coming up from Hawkshead, Yewfield is on the Drunken Duck road). Go through Hawkshead on the Ambleside road B5285 for approx. 06 miles and take the left turn onto Hawkshead Hill and sign posted for Brantwood. Go up the hill for approx. 1.6 miles and turn right at the Baptist Chapel go down this short country lane and turn right on to the Ambleside road, Yewfield is the second drive on the left. Our room was very impressive. Breakfast was super. By chance we arrived on an evening when there was a very enjoyable concert.